Move over frozen yogurt, upscale pizzerias are taking Boulder by storm! Tossa Pizza is one of Boulder’s newest additions to the pizza family, but this rookie is not to be overlooked. Tossa seeks to create a welcoming atmosphere suitable for daters, families, and friends. On Valentine’s Day, it was just about the only spot in Boulder willing to take a last minute party of my girlfriends and I. Given that it was Valentine’s Day, my single soul sisters and I found it appropriate to indulge. Luckily, Tossa’s hefty menu (including small plates, salads, pizzas, pastas and wine) and humble prices favored our appetites and wallets. When was the last time you saw anything on a menu for two bucks? I’m not talking a side of bread or a happy hour plate of olives, but a real dish with prominent real estate at the top of the page. 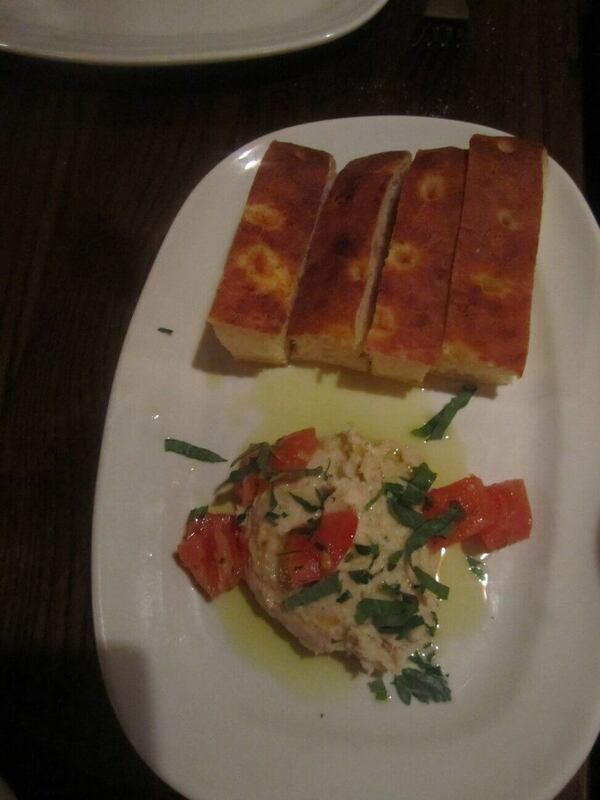 Well, my friends, here it is: the Tuscan White Bean Dip, served with their signature house-baked bread and drizzled with Italian olive oil. This was the perfect way to satisfy our hunger while the real stuff bubbled in the oven. 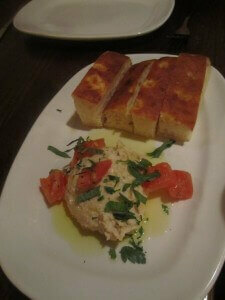 The bread was fluffy, warm and perfectly spiced, and dip was rich, creamy and yummy with the basil, tomatoes and EVOO. 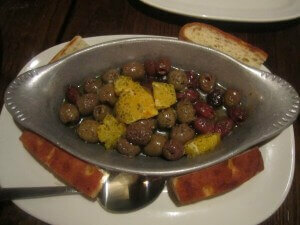 We also opted to try the Warm Olives tossed with herbs, olive oil and citrus, also served with their brilliant bread. I was first introduced to olives served warm last week, so I insisted that my olive-virgin friends give them a fair shot. I quickly became very popular. Though not quite the same bargain as the dip, it was equally delicious. Yet among all the delicacies that landed on our table throughout the evening, perhaps it could have been skipped. In an effort to balance our shameful carb intake with some greens, we also opted for a salad. We ordered one of the specials of the day, a romaine salad tossed with fresh mozzarella, garbanzo beans, parmesan cheese, roasted red and yellow peppers, olives, Tuscan roasted chicken, and their specialty scrumptious sun-dried tomato vinaigrette. 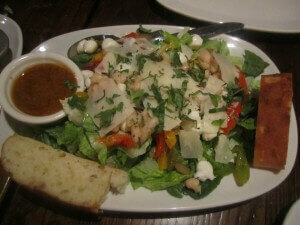 It was the perfect combination of special toppings, without it taking over the salad and becoming too filling. And finally, the big hoorah: pizza! Tossa’s menu is rather short and sweet for a pizza joint, but also allows diners to customize any pie to their liking. For the quality and size, I’d say their menu boasts knockout prices. My group settled on one of their specialty pizzas, a large Mushroom and Truffle Arugula salad pizza. 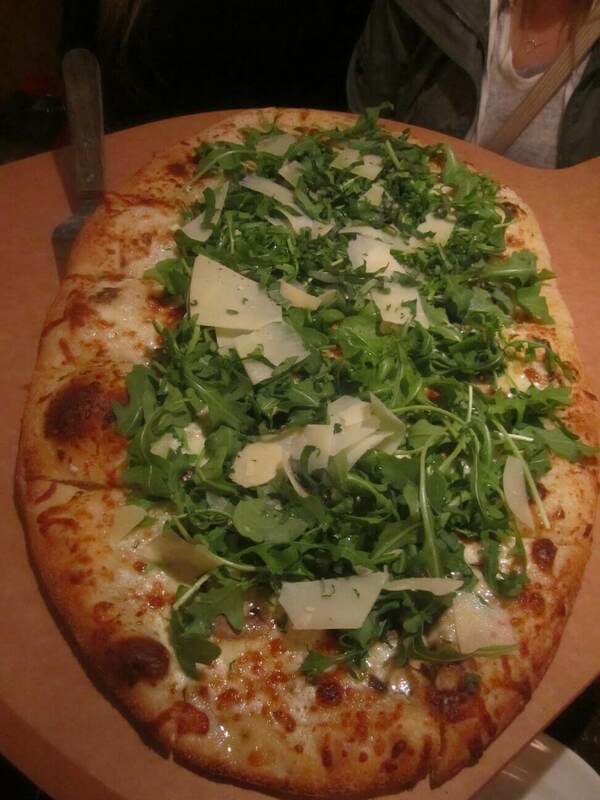 Piled on top of the fluffy dough (white pizza) were mushrooms, parmesan, mozzarella, aged provolone, fresh basil, fresh arugula, truffle oil, and some more parmesan. My recent philosophy is that truffle oil makes everything better, so combined with mouth-watering dough and other fresh ingredients, this pie was sublime. Within the niche of Boulder’s upscale pizzerias, Tossa gets my vote for takeout. The atmosphere is lacking and food is not as gourmet as Pizzeria Locale, but for a true foodie, skip Cosmos and head to Tossa (hold the spicy ranch).